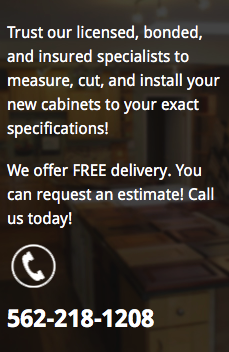 INSTALL A BEAUTIFUL NEW CUSTOM OR PREFAB COUNTERTOP! 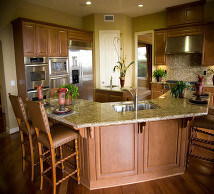 When you want a beautiful new granite or durable countertop, Pacific Cabinets & Countertops is the perfect choice! Our professional and punctual installation specialists will consult with you to decide which material and color is right for your home. We’ll install them easily and quickly. Trust us to leave your home tidy and clean when we leave! Don’t settle for big name stores. Get great customer services from us! 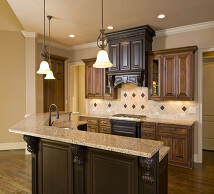 Countertops- add the finishing touches to any cabinetry project with the right countertops! From style and quality to functionality and durability, our countertops make it easier to keep your kitchen or bathroom cleaner and safer for your family. it functions well while adding luxury to your home for decades! Quartz- all quartz countertops are 93% quartz stone and 7% bonding agent. 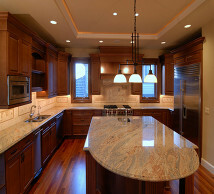 All quartz countertops are man-made and made similar to granite. While similar, they are 4 time stronger! Quartz is a great choice for countertops because it comes in a wide selection of colors and is resilient against bacteria! Solid Surface- these countertops are made of man-made acrylic. They are stain, moisture, sunlight, and heat resistant. Mold them to any shape and repair them easily. Make your entire kitchen or bathroom look completely seamless! Laminate- this is the most affordable option. There are thousands of colors and patterns available to make your laminate countertops look like real quartz or granite without the hefty price tag. Wood Countertops- from bamboo to teak, wood countertops come in a wide selection of species and stains. Whether you like traditional wood styles or something exotic, we can highlight exactly what you want. Once cut to the different thicknesses needed to get the best look, the wood can be sealed for low-maintenance care!